When the company staff feel appreciated, they walk with their heads held a little higher. There are many different ways a business owner can reinvest and work to strengthen his or her company. One of the most effective means of ensuring that everything runs smoothly is to organize, plan, and host an epic employee appreciation event. Check out the tips, suggestions, and hints detailed below to help make your company appreciation event professional, fun, and unforgettable. After you hire a new worker, you get to tell them what their work schedule is going to be. There may also be mandatory meetings and other times when staff are required to come in. When planning an epic employee appreciation event, you want your staff to do more than just be present; employees should also be happy, interested, and paying attention. So, you might want to do a little more than just set up a projector and list names off a piece of paper. Get some of your employees involved in the planning portion or at least ask them for feedback. Take a vote about catering choices. Ask the staff if they would rather have the event on-site or off. If they believe that your employee appreciation event is going to be fun then they will want to participate as much as they can. In order to have an employee appreciation event that is appealing, you have to up the ‘fun factor.’ Is there going to be music and dancing? Will there be a bunch of silly props for them to wear at the photo booth? Only you can decide which activities are going to be appealing to all or more of your workers. You can either try a one-size-fits-all approach or you can choose a variety of things so that it is likely that everyone finds something that they like. The other important thing for you to do is to have everything organized and planned so that the event follows a set sequence of events. A workplace event where employees are to be appreciated is partially about fun but also partially quite serious. 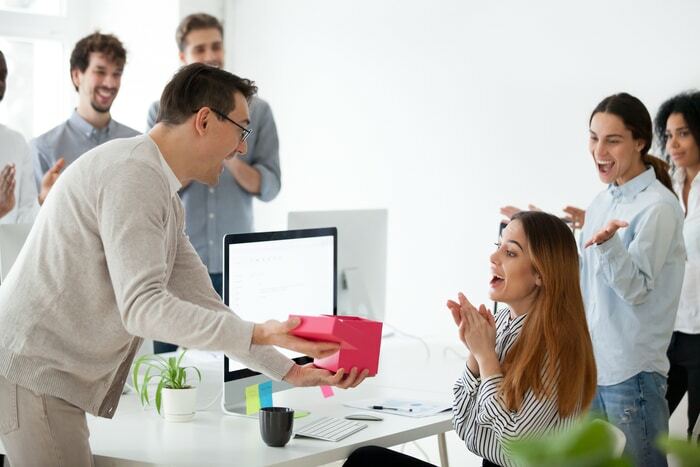 If you are going to recognize your staff for being dedicated and professional then you want to celebrate their efforts in a manner that is respectable. Plaques, certificates, and even trophies are all fine methods of showing that respect and appreciation to your workers. Also, think about getting lapel pins made up so that everyone can feel included. You can put your company or brand logo on them and pass them around as everyone is coming in or leaving. Since they are small and discrete, lots of your workers will be happy to sport your company lapel pins whenever they are wearing professional business attire. Give out gift cards or even pay for your very best workers to go on vacations if you truly want them to feel like their efforts to better your company are being recognized. A lot of businesses that choose to recognize employees do so in a way that makes each worker feel like a number rather than an individual. Getting a bunch of t-shirts made up just isn’t going to do it if you want to have an epic employee appreciation event. Get lapel pins made. Have an oversized trophy engraved.? Pull out a couple of tickets to Hawaii and hand them over to the star employee at your company. They will remember how much they are appreciated and will always want to go the extra mile for you, themselves, and their fellow co-workers.